Petryna, Adriana. 2011. “Chernobyl’s survivors: Paralyzed by fatalism or overlooked by science?” Bulletin of the Atomic Scientists 67 (2): 30 -37. DOI: 10.1177/0096340211400177. Available at http://bos.sagepub.com/content/67/2/30.abstract. 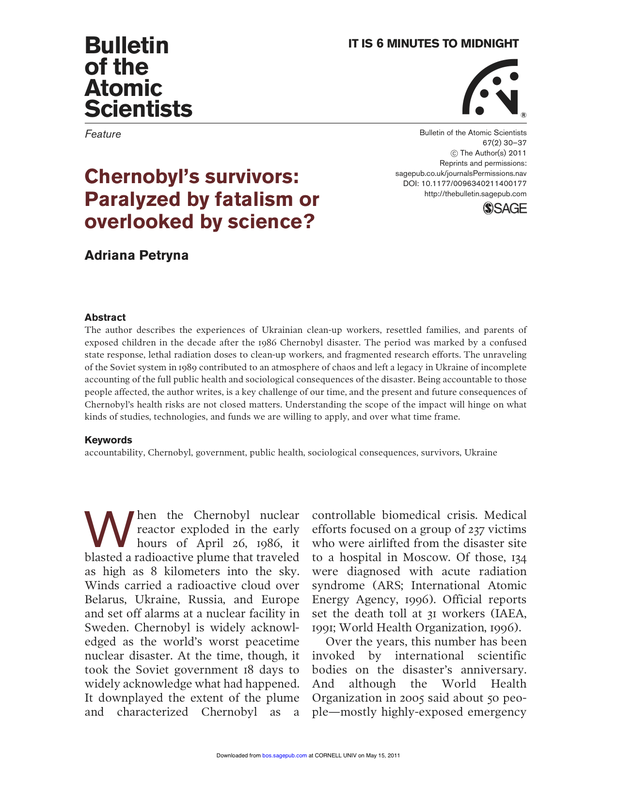 This is an article by Adriana Petryna, an anthropologist who conducted field work in the Ukraine following the nuclear accident at Chernobyl. Like her book Life Exposed: Biological Citizens after Chernobyl, this article helps provide a point of comparison for understanding some of the issues facing citizens exposed to radiation from Fukushima, as they begin what is likely to be a long and lonely struggle for social and political legitimation as victims of the policies of the state-supported nuclear power apparatus in Japan. Such a conclusion trivializes the activities and efforts of those who tried to avoid exposure to radiation. In light of Japanese studies of the effects of the atomic bombs, an even longer period of investigation will be necessary in order to come to any legitimate conclusion in this case. The collapse of the Soviet Union and the implementation of a market economy broke off years of data collection. “Safe” limits of radiation exposure are contingent upon historical and political contexts. The politicization of bodies seeking compensation for damages continues today. For these reasons and others, Petryna stresses the continued necessity of confronting and examining the damage caused by radiation. Petryna, Adriana. 2002. Life Exposed: Biological Citizens after Chernobyl. 1st ed. Princeton, NJ: Princeton University Press.